"Army of Darkness" --A bright spot on the comic rack! Check out Issue #3--Niles, Calero, Suydam! 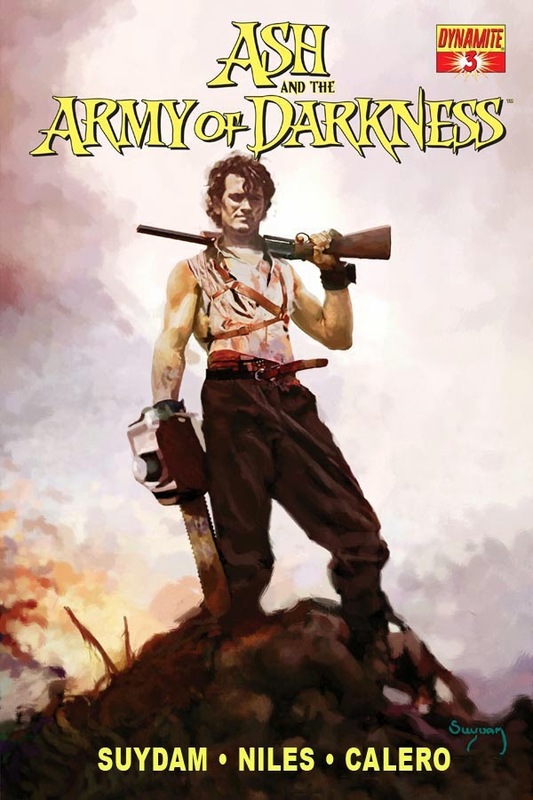 If you haven't checked out "Army of Darkness" yet, what are you waiting for? Penned by the amazing Steve Niles. Interiors by award winning artist Dennis Calero, and frontage by award winning artist "Zombie King" Arthur Suydam who renders covers for this epic horror series ! In this issue, an old love returns and Ash finds himself with an ally after escaping Wiseman's City of the Dead. Now the search for the Book of the Dead is on and whoever finds it first can either escape or destroy the world. Only a book and a few words are all that separate the world of the living and the dead... and a new war is brewing. Joe Sinnott Documentary Now Available! "A Guy Named Joe" from Eva Ink and Creator Chronicles! 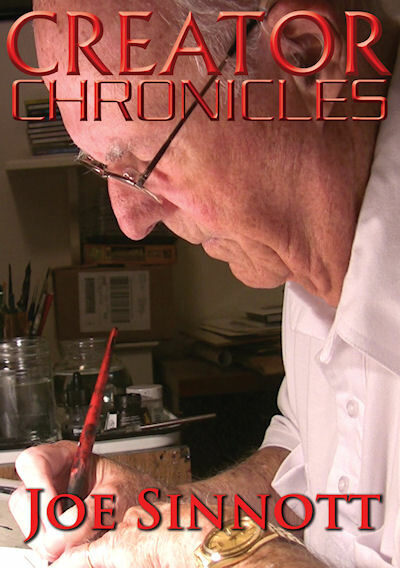 I just did my final edits on this great documentary last night, "Creator Chronicles Legends-- Joe Sinnott," and it's off to be burned as we speak. But frankly, Robin Dale, the director, did an amazing job, and I had very few suggestions for changes. It was truly a labor of love on Rob's part, as he looks at the life and career of not only one of the greatest inkers in comics, but an amazing artist as well! I, myself, was blow away as the documentary outlines some of Joe's early work and sequentials from the 40's and 50's really before his Marvel days (although he worked at Timely with Stan Lee before then.) What beautiful artwork and storytelling! Joe was the master of facial expressions as well, in case you didn't know. The doc is 3 hours long, and that's just the part on Joe's life and work. Honestly, as watching it, I was looking for segments to cut out to make it a bit tighter, as part of what an editor does, right? But I loved it all, so what the hay! Three hours it is. And for me it sped by. Full of old pictures from Joe's life, and of other comic folks (including your's truly who was at his retirement party in 1992--Oh the hair! ), this is an amazing and consistently interesting, visual tribute. In addition, you get 3 drawing segments on the DVD, with more commentary from Joe. One of a Thing sketch, one of a Spidey Sunday strip, and one of Joe inking a kirby sketch from the 1970's. If you love comics, comic history, and Joe (who doesn't, since he's touted really as one of the nicest men to have ever worked in comics), this is a must have for you. In the meantime, here is the link for ordering, as well as a little more on this little labor of love. AND, while you are there, take a look at the other DVD's Rob and I have produced, including ones on Michael Golden, Joe Jusko, Bill Sienkiewicz, George Perez and Matt Wagner. The term “legend” gets thrown around a lot in comics, but few truly personify it better than Joe Sinnott. Widely considered to be the best inker to have ever graced the comic medium, Joe is also a fine artist in his own right, having done a wide variety of art from comics, to illustration, newspaper strips, advertising, and realistic caricatures and biographies. In this very special DVD, we talk to Joe and many of his colleagues and peers in the comics industry for this first Creator Chonicles Pioneers series documentary. Bob Almond, Jim Amash, Terry Austin, Sal Buscema, Ron Frenz, Mike Grell, Joe Jusko, Elizabeth Amber Love, Andy Mangels, Jerry Ordway, George Pérez, John Romita, Sr., Jim Salicrup, Alex Saviuk, Richard A. Scott, Jim Starlin, Herb Trimpe, Bob Wiacek, and Stan Lee, with a special appearance by Jim Steranko! As an added bonus to this DVD, Joe does 3 full art tutorial pieces. The first is a great pencil sketch of the Thing, the second is inking a Spider-Man sunday strip, and the third is simply amazing: Joe Sinnott inks a Jack Kirby original full-figure sketch from 1976! Eva Ink Artist Group/Eva Ink Publishing At a Show Near You in 2014! Our convention schedule is fleshing out for 2014, and we have many exciting venues planned, with appearances by Michael Golden, Mike Zeck, James O'Barr, Dennis Calero, Arthur Suydam, Matt Triano, Richard S. Meyers, Renee Witterstaetter, Rodney Ramos and more to be announced! And new projects on James O'Barr, Mike Zeck and Nick Cardy, to name a few! So, check your local shows website! Also if you know of a show that we are not booked at, contact me at: evaink@aol.com. And be sure to come and visit me at any of these appearances, bring your portfolios for review etc. I'll be sitting below or near the Eva Ink banner! Happy 2014 From Eva Ink Publishing!